Dethroned; with a withered hand; and outcast from power, Yarvi might not seem like even the half a king of this book's title. 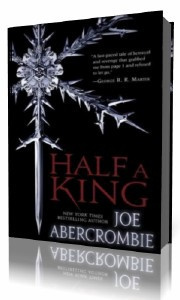 But the hero of this gritty new Joe Abercrombie fantasy series is determined to retrieve the Black Chair stolen by his betraying uncle. To achieve that seemingly impossible task, he must first assemble a motley crew of loyal misfits, outcasts, and wiseacres. Action-packed and spiced with lively, brilliant dialogue. One series to watch.